After a 20-year hiatus, Australia’s most notorious populist Far Right politician has risen to power again. 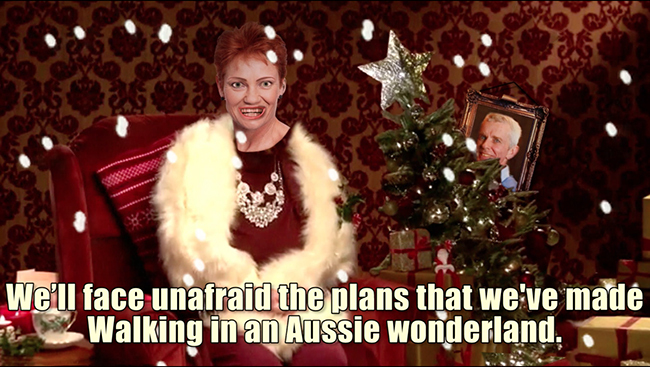 Pauline Hanson came out of the woodwork in 2016 to run for the Australian Senate, and win 6 seats for the Pauline Hanson One Nation Party. One Nation has been accused of “xenophobia”, homophobia, climate denial and contempt for Aboriginals, welfare recipients and trade unionists. Hanson’s career began in the mid 1990s, when she asserted that Australia was being overrun by Asians. Today, it’s Muslims, and Senator Hanson’s call for a halt to Muslim immigration has fuelled Islamophobic sentiment around the country, and divided the nation. This entry was posted in ANONYMOUS, ARTS, EDITORIAL, LIVING PROOF, NEWS and tagged ONE NATION, PAULINE HANSON. Bookmark the permalink.